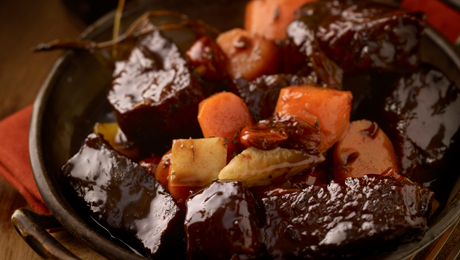 The Stout not only tenderises the beef but also adds a lovely malty flavour to the stew. Drizzle some olive oil into a pan over a medium heat and add a knob of butter. Add the meat to the pan in batches and quickly brown, remove the meat from the pan and place in a casserole dish, season lightly. Using the same pan add the remaining butter then add the onion, garlic, carrots, celery , parsnip and thyme and cook for 3 – 5 minutes. Season well. Sprinkle the flour over the vegetables then add the tomato purée, cook for a further 4 - 5 minutes. Pour in the stout and warmed beef stock and a few drops of Worcestershire sauce. Pour the pan contents into the casserole dish and cover with a tight fitting lid and place in a preheated oven at 150F/300F/Gas Mark 2 for 2 -3 hours, checking occasionally to ensure there is enough liquid in the dish. Once cooked remove from the oven and check the consistency of the cooking juice. If too thick add a little extra beef stock, if too thin, let reduce down for a few minutes extra until a nice gravy like consistency is achieved. Serve immediately on it’s own or with some mashed potatoes if desired.